Emma Wright writes this magnificent report about her courageous journey on the way to competing in the Blackpool Half Marathon. Well before I start, I’ll apologise for my attempt at a race report! It’s my first time so go easy on me! It’s probably not your usual race report in that it contains information about 3 races….mostly because it’s taken me forever to get around to writing them! On 8th January 2013 I was about 2 miles into my 10 mile run, feeling full of confidence as two days before I had ran 19.5 miles, the furthest distance I had EVER ran in my 14 months of running! Marathon training was going well, I felt fantastic and ready for my first marathon in February! Unfortunately I never got to finish my 10 mile run and instead ended up in the back of an ambulance after been knocked over by a car. After coming around I felt devastated… Knowing at a glance that I would not be running anywhere, anytime soon and certainly not 26.2 in 7 weeks time! I spent weeks feeling very sorry for myself, moaning to anyone who would listen… including my facebook status updates so apologies for that! After the accident I spent the first 4 weeks on crutches, barely able to get around but then slowly, with the help of physio I started to become more mobile and eventually managed to walk without the crutches. Marathon day came. The 24th February 2013… A day that I will always remember! I was in Seville, a beautiful city and the venue of what should have been my first marathon. Instead of running I was supporting Ryan (Hogben) who had returned to Seville having been unable to run the previous year due to injury. First of all I need to say Seville know how to put on a good marathon… For £17 we had entry to the marathon, pasta party before and after (including free beer!!!!!! ), a fabulous goody bag including running shorts and vest as well as an amazing finishers medal. So upon arrival at the marathon expo and pasta party I decided to take full advantage of the free beer to drown my sorrows! The pasta party was set within Isla Magica (a theme park) and it was fantastic! The sun was shining, live band playing and spirits were high! We got to chat to people (or try… with a bit of Spanglish) from many different countries and were even invited to join a Spanish running club! The morning of the marathon arrived, I had mixed feelings, excited for Ryan but sad that I couldn’t run. We arrived at Estadio Olimpico de Sevilla, the sun was shining and the stadium was buzzing! We followed the well signposted road to the start line, Ryan was nervous but I had every confidence he would do well, he trained hard and was well prepared! He headed off into a crowd of other runners and made his way for the ‘sub 4 hour’ section. As he waited in anticipation, I headed off into the crowd of supporters and shed a tear that we wouldn’t be sharing this marathon experience. I ‘had a word with myself’ and thought that all things considered I was very, very lucky and would have lots of opportunities to run marathons in the future. Ryan tells me the marathon course was beautiful, more so because the sun was shining throughout the day. The marathon course followed a loop around the city, crossing the mighty Guadalquivir River on four separate points. Most of the course was on the south bank of the river sending runners weaving their way around the historic centre of the city. It was a flat and fast course and had massive PB potential. As Ryan took in the sights of Seville I waited within the stadium taking in the atmosphere and chatting to other supporters. As the clock approached 3 hours 45 minutes I turned my full attention to the track within the stadium where Ryan would be finishing and sure enough I spotted the amazing sight of a TBH vest. He was approaching the final 100m at quite some speed, as I glanced at the clock I realised why… it was approaching 4 hours. With a look of sheer determination, Ryan sprinted the final part of the marathon and achieved his goal, finishing with a time of 3hours 59minutes and 56 seconds…..
We have already decided we will be back next year, this marathon is well organised, has excellent support, fantastic value for money and takes you around one of the most beautiful and historical cities in Spain! And next year I will be running, no matter what!!!!!! After returning from Seville and experiencing the atmosphere of the marathon I had a renewed determination to get back to running as soon as possible! So I decided to pull on the trainers and see how it felt… I managed my first mile… It was slow and painful but I was ecstatic! Each run I went a little further and it slowly started to feel more natural and comfortable. At first I felt so disheartened, I was so slow and couldn’t run anywhere near the distance I could run before the accident. But I stuck with it, determined to get my fitness and running back on track. 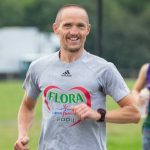 After a couple of weeks I decided I needed some focus, something to aim for, so I decided to enter a race… See how I got on! After researching I settled on the half marathon at Northampton Running Festival. Obviously I dragged Ryan along too, but other than that I didn’t tell a sole. That way I figured if I crash out, nobody would ever know! The race would take place on Easter Sunday, the 31st March 2013, just over 11 weeks since the accident. The running festival was set within the grounds of an historic 14th century Abbey and was described as a picturesque, flat course. Only in it’s second year, the running festival had around 400 runners doing their distance of choice 10k, half marathon or full marathon. Now as we all know, southerners (no offence to any southerners at the club…Sophie Marr) do not handle snow, ice and general bad weather the way us northerners do and a few days prior to the race there seemed to be some concerns that the race would be cancelled due to bad weather! However, thankfully the southerners ‘manned up’ and the race did go ahead with a slightly altered course! As we arrived at the Abbey, it was a cold but beautifully sunny morning with very little wind, perfect running conditions. We joined a queue to collect our numbers which were given out efficiently by friendly staff and then we waited. Following a short briefing, the 10k runners were off, followed 5 minutes later by the half marathon runners and then a further 5 minutes later the marathon runners were away. The course was designed in just over 2 mile loops through woodland and past a lake within the grounds of the Abbey….I think that perhaps this would have been slightly soul destroyed for the marathon runners as they had 12 laps to run! However, I quite enjoyed the half marathon which was 6 laps. I don’t think this kind of race is to everyone’s linking but I enjoyed the picturesque views around the lap and we also got to pass through the starting area where all the supporters were waiting and cheering us along. At the end of each lap, there was a water station, also included energy gels. So, as the half marathoners were called Ryan and I headed to the start line and found ourselves at the front! Our TBH vests were causing quite a stir, some organisers and competitors were quite impressed by the distance we had travelled to race! We watched the clock and then got our 10 second count down and then we were off! Ryan and I predictably set off at a fast pace! I realised I needed to slow down or I’d probably have passed out before finishing the first lap, so I settled into a nice pace and watched Ryan run off into the distance. I enjoyed the views of the woodland and lake and found that against all odds I was running well. The course was tough and got tougher due to the terrain which was muddy to say the least but it became more and more difficult on each lap after 400 runners had trampled through the woodland! I was apprehensive, my ankle had not experienced such terrain since my experience of ‘The Pain Barrier’, well before the accident! Despite this, I kept going, determined to finish. As I passed through lap 3, just under half way I saw Ryan standing with the other supporters…I was confused, I mean I know he went off quickly but there was no way he could have finished already. He smiled encouragingly and told me everything was fine, so I continued. I later found out that a few niggles had forced him to pull out of the race. As I entered the final lap, I was starting to struggle and feel pain in bad ankle but there was no way I could give up now so persevered before finishing in a reasonably respectable time of 1 hour 52 minutes. I was pleased considering I had been aiming for 2 hours and realistically didn’t think this would be possible. I received my medal and feel that this one will always be a little bit special, my first post injury race DONE! And so we started the long journey back to Newcastle, I was doing the thing I love to do most after completing a race…planning what I was going to eat!!!!! We then had a lovely evening out, including a few celebratory drinks…obviously! When we got home Ryan checked online to see if the ‘official times’ were available and then he told me something that made my day and return to racing even more special…I had finished 3rd female in my age category!!!!! I couldn’t believe it, I was absolutely amazed but ecstatic! The confidence boost I needed, which could only mean one thing….. ANOTHER RACE! 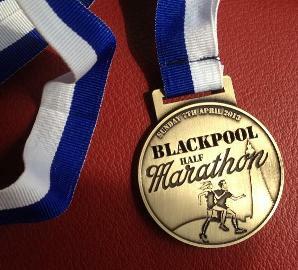 As luck would have it, Blackpool had a marathon and half marathon the following Sunday….so guess what we entered! So this brings me to the final part of my ‘race report’, thank god I’m sure you’re thinking! We arrived in Blackpool the day before the race. Ryan was to do the marathon and I would do it half marathon. We arrived at Bloomfield Road, Blackpool’s football ground and collected our race numbers before heading to our hotel for the night. We followed our usual pre-race rituals including pinning numbers to our vests, putting the garmin’s on charge and getting everything ready for the morning. We then decided it was time to relax, a little swim and sauna did the trick nicely. Then it was pasta time… before a nice early night. We woke early, both a little quieter than usual, contemplating the task ahead of us. After fuelling up, we made our way back to Bloomfield Road, the venue for the start of the race. It was much busier than it had been the previous day, everyone making last minute preparations! The event was well organised and there were lots of people around to help and give advice. My only complaint was the distinct lack of women’s toilets!!!! I walked to the back of a ridiculously long queue, wondering if I could pop into the mens toilets!!!! You’ll be pleased to know I decided against this. With not much time to spare we made our way to the start line, just outside the stadium for the 9.30am start. There were around 1700 runners in total, with around 1050 running the half marathon. We were well packed in to the start area, I had a flash back to the Great North Run! There was a slight delay in starting but just before 9.45am we had our countdown and felt a surge forward, we were unable to start running straight away due to the sheer volume of people ahead of us and the first 1km was quite difficult so my tip would be, get as close to the front as possible! As the course opened up, the runners spread out and were were able to get into a steady pace. Ryan took a much slower pace given that he was doing the marathon but I did my usual…. set off at a fast (by my standards) pace, before settling into a steady pace. I decided not to focus too much on the garmin and just run. The course was a loop along the promenade, one loop for the half and two loops for the marathon. It was well supported along the way and I heard lots of ‘come on tyne bridge’ which was encouraging. There were lots of club vests around me but mostly local clubs, although I did see a Heaton Harrier! The course was flat and fast and the weather was perfect, with no wind. Had it been a windier day, I can imagine this would be a very difficult run! The views of the sea, beach and promenade were lovely, although Ryan described it as ‘slightly boring’ for a marathon. As with any race I had a time in mind and really wanted to achieve a time of between 1 hours 45 and 1 hour 50, although I knew I couldn’t be too hard on myself if I didn’t manage this given that I had just returned from injury and had done a race the previous week (excuses I know!). There were 4 well spaced our water stations throughout the race with bottled water but no energy drinks. As I approached the 11 mile marker I glanced at my watch and was amazed… If I worked hard, it was possible for me to achieve that 1 hour 45 time, so I upped my pace and felt strong! I’d had two female club runners in my sight throughout the race and decided I needed to get ahead. As I got ahead of one of the runners she upped her pace and came level with me. I loved the bit of competition and this made me even more determined, so much so that my final mile was completed at 6.45 pace!!!!!! I crossed the finish line within Bloomfield Road in a time of 1 hour and 45 minutes and 14 seconds…and yes ahead of the two club runners! Absolutely exhausted and overwhelmed but delighted with my result. I collected my medal and made my way towards the changing area, sparing a thought for Ryan who had the whole thing to do again!!!! Ryan also had a fantastic run achieving another marathon PB, finishing in a time of 3 hours 51 minutes. The results were printed swiftly and attached to the wall within minutes of finishing the race. I later checked and found that of the 417 female runners, I had finished in 29th position…not to bad at all for a second post injury race! Overall I’d say this was a well organised and good value for money race. There were enough runners to have a great atmosphere and the support along the way was great! I will be back next year to improve on the time and would encourage any of you club members who like a half marathon to give it a go! So, if you made it to this point…well done I owe you a pint!! Well done Emma. A great story and an inspiration to us all, showing quite clearly what can be achieved regardless of what gets thrown at us runners. Or in your case, what you throw yourself at (a car). Well done and thanks for the report. Well done! Brilliant result, especially after an injury! Blackpool was my first ever marathon, managed to get around in 4:55. I enjoyed the day, but still sore! I also mentioned the lack of toilets on my blog, dunno how the women marathoners coped! Thanks for a fantastic report Emma. It goes to show, no matter how bad things may get (and getting hit by a car is certainly bad ), there is always light at the end of the tunnel. I can’t wait to read your (future) marathon race report. Great perseverance Emma to come back with strong runs, well done! Well worth the read Emma! Inspiring stuff! You got my attention early on in your report with the mention of “FREE BEER”! But I read the whole of your inspiring race(s) report. A great story with drama and a final triumph, Hurray! Well done, Emma, I look forward to seeing you out on your long Sunday runs again soon, we used to pass each other before your accident and, usually, the further into our runs we were, the more tired but more determined I think we both looked. Fantastic report Emma, Well done not just on your recent half marathon races, but coming back from such a bad injury, although it may feel like it has taken a while for you to get back running again the perseverance and strength (mental & physical) shows it all pays off in the end! Great report and great story! Well done! Proper TBH resilience!